If you've enjoyed this post, please click on the image above and pin it. If you ever stop by my Facebook or Instagram feed, you'll have noticed that I've been enjoying learning, experimenting and playing with collage after recently adding a bonus project to my online class, Fragments Of Joy. There are just so many ways to use collage in artwork and there are pretty much no rules - this is good news to me and to you! In this free tutorial, I show you how to integrate photographic imagery (see reference photo below) along with a hand-drawn expressive portrait. I also incorporate a pressed oak leaf, grasses, lace etc - please scroll down the page to see the supplies I used. Along the way, you'll be there as I encounter 'issues' and see how I overcome them. You'll gain some understanding for my choices of items to add from a compositional point of view and how it evolves into a final piece of artwork. The photographer's name is Annie Spratt (love her work) and here is the link to this royalty free image obtained via Unsplash. Paper towel, water, palette paper etc. I feel privileged to have been your creative guide for this tutorial and would like to encourage you to keep going, keep learning and developing your own style - oh, and have fun! Want To Have More Fun With Collage? Why Not Purchase Fragments Of Joy? To purchase the class - Fragments Of Joy, click the button below. Please note, if you're a Hearts Letter subscriber (or would like to be), you automatically receive a 20% instant discount code for both my classes - (£35 normally or £28 with discount). This class is available worldwide and can be purchased using a debit or credit card on this secure site. Here is a handy currency exchange checker. I've been enjoying creating paper collage portraits this week and judging by how many positive emails and comments I've received, I thought it would be a lovely to add this project (at no extra cost) to Fragments of Joy - Play and Possibilities With Collage - one of my online art classes. If you like this post, please consider clicking on the image and pinning it - thanks. The classroom is open, the videos are all downloadable and the class is self-paced. This means that even though you may be really busy this summer (and beyond) with children off school, holidays, day trips etc, you get to dip in and out of the content when it's convenient for you. In case you're wondering, there are three other full projects (plus this new one), five mini projects, a little piece on art history and more! The full description for the class is here and the short description underneath. For the full class description, click here. This class is all about letting go using collage. Enjoy the feeling of spontaneity as you create collages using 'fragments of joy' ie. scraps of paper, fabric, lace etc. Make a 'memory or story' photo collage in a re-purposed book and then be filled with delight as you piece together a floral still life. Watch your artwork transform with the addition of atmospheric transparent layers. Embrace play - make art that doesn't have to 'make sense' but instead makes you feel joyful! 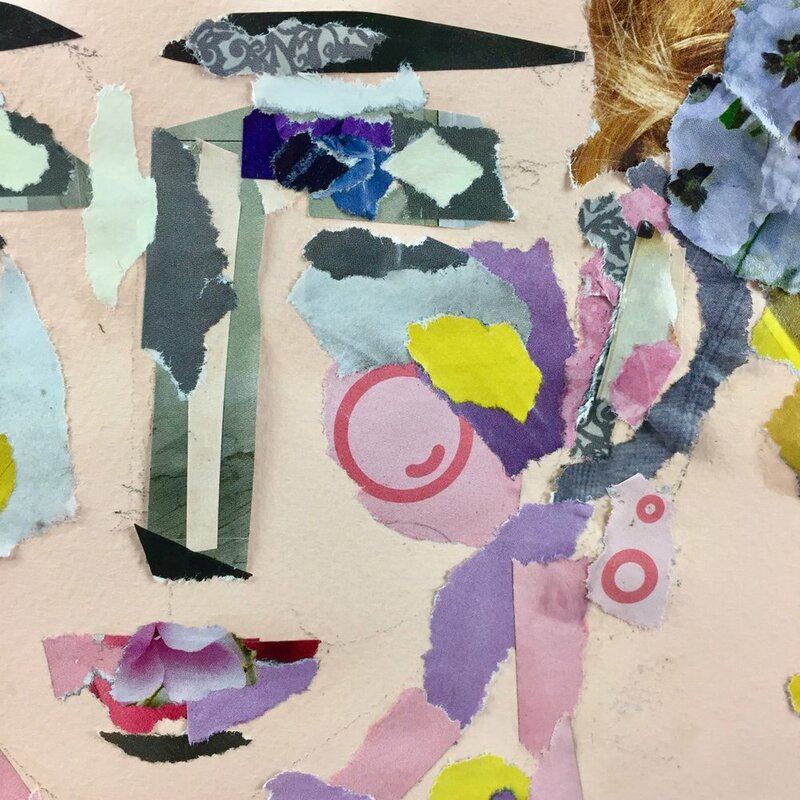 Receive lots of tips, suggestions and ideas for using collage as a way to explore new inspiration as well as take a little detour as to how some famous artists have embraced collage. This class is perfect for the beginner, or someone who just feels they don't possess any creative gene but would really like to try (incidentally, I believe we are ALL creative). Equally, an artist would find this class great for a tackling a creative block, for trying out new ideas or if you're just needing to 'let off steam' and have some fun with spontaneous jumping off points like Matisse did when he began 'carving into colour' - by the end he'd made over 120 of them! I hope you get to join us over in the classroom. Feeling Blessed 48 Hour SALE! I hope you're all having a wonderful week and for those of you in the States - Happy Thanksgiving! I'm thrilled to announce a 'Feeling Blessed' 48 hour sale! Head over here to receive 25% off BOTH ecourses - Portraits In Time and Fragments Of Joy. Please enter: FEELINGBLESSED at checkout to receive your discount on either art class. Here's to happy creating this winter season! Note: For both classes, enjoy instant access with lifetime duration. Enjoy some time 'just for you' this winter season - a time of year that brings with it so much joy but also busyness, which can soon take it's toll without some nurturing and creative 'time out'.